BRIGHTON, Mich - As thousands and thousands of people roll into the Cobo Center in Downtown Detroit, they are face to face with thousands of glossy, brand-new automobiles. The latest and greatest vehicles are on display in all of their glory, showcased to parade their very best features. Presentation is everything and with 66,000 square feet, Ford Brings a Remarkable Display to the 2014 NAIAS. Ford Motor Company raised the bar this year with an impressive 66,000 square foot display at the 2014 North American International Auto Show. A 37.5-ton display simulates a moving assembly line is the perfect touch to compliment the fresh vehicle lineup, latest technologies and innovations, and awesome interactive exhibits. This year has an additional upper-level exhibit that features the all-new Mustang, sitting perfectly near the Concept II developed by the 1962 Mustang design team. "50 years of Mustang" and "The Future of Tough" are the two main focuses of this year's display. The 82 vehicles and interactive displays are showcasing Ford's new lineup of products. Consumers are able to interact with Ford vehicles that will show the ultimate potential and quality that these new products have to offer. The smartest, toughest, most capable all-new Ford F-150 is ready for all to see as the center attention in the "The Future of Tough" presentation. A huge display, measuring 22 feet in height and 75,000 pounds, moves trucks in an assembly line showing the F-150 construction. Each faze of the construction follows themes of durability, capability, efficiency, and technology. The 2015 Mustang is of course a main attraction at the Ford display this year. The upper-level exhibit area is a celebration for the 50th anniversary of Mustang. Visitors can enjoy tons of cultural and historic artifacts and reference to the Mustang's impact on fashion, film, food, and fun throughout the last 50 years. Revell® is providing a free Mustang model kit to young car lovers who visit the Ford display, while supplies last. This is said to be the largest consumer experience Ford has ever had at the NAIAS according to David Tillapaugh, the global auto show operations manager for Ford. The North American International Auto Show goes through January 26th. 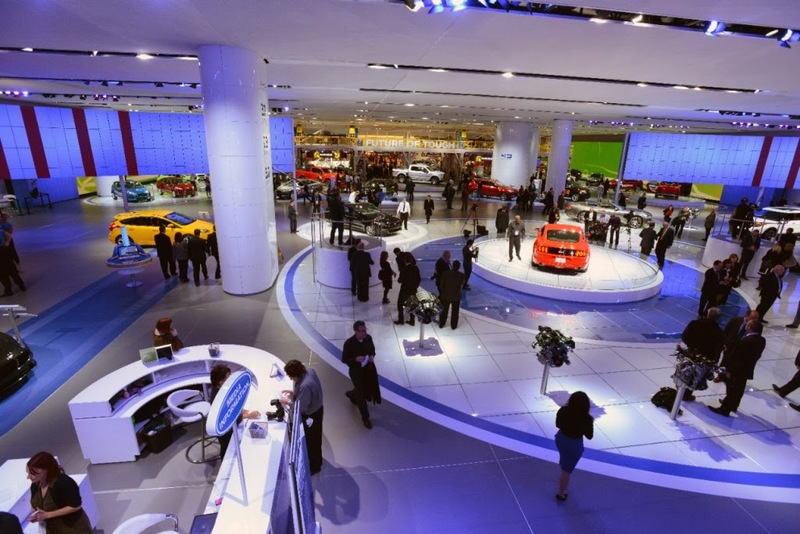 At Brighton Ford, we couldn't be more excited to partake in the Ford display at the NAIAS. We look forward to the receiving the latest automobiles at our dealership! At Brighton Ford, we are here to help those in Dearborn and surrounding areas find and afford vehicle of their dreams! Brighton Ford can assist you in getting the Auto Loan you need to purchase the Ford you deserve!